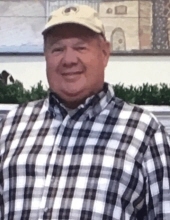 Allen Bowen, age 59, from Hurley, MS, passed away unexpectedly Saturday evening, July 14, 2018, surrounded by his family. Allen was born on May 18, 1959, at Singing River Hospital in Pascagoula, MS to the late Robert Basil Bowen and Bobbie Branning Bowen. Allen married the love of his life, Beverly Denton Bowen, on July 3, 1978. He worked for over forty years driving a truck for himself and others and was currently driving for one of his best friends, Teddy Fields. This was not just a “job” for Allen, it was what he loved to do. He had an infectious smile that lit up the room. Allen was most of all a man that loved everyone, especially his wife, children, grandchildren, siblings, extended family, and friends. He lived life to the fullest by calling his family and friends each day and telling them he loved them. The world will never be the same for those he left behind and he will be sadly missed by all of us. He is survived by his wife, Beverly; two daughters, Jennifer (Daren) Larson and Stephanie (Eric) Danis; five grandchildren, Abby, Emily, Cody, Brooklyn, and Lauren; three siblings, Donnie Bowen, Lisa (Anthony) Grayson, Connie (Jamie) Arender; mother-in-law, Betty Denton; sister-in-law, Brenda Havard; and step-mom, Teresa Bowen; along with numerous nieces, nephews, aunts, uncles, and cousins. Along with his parents, Allen was preceded in death by his paternal grandparents, Robert Delton and Mae Bell Bowen; maternal grandparents, Reon and Doris Branning; father-in-law, Bill Denton; brother-in-law, R.D. Havard; and many other loving relatives. Family, friends, and others whose lives Allen touched are invited to attend a remembrance ceremony. The family will be accepting friends from 5:30 p.m. until 6:00 p.m. Thursday, July 16, 2018, at Heritage Funeral Home in Escatawpa, MS. The remembrance ceremony will begin at 6:00 p.m. in the funeral home chapel with Bro. Anthony Grayson officiating. In lieu of flowers, the family asks for Prayers and Blessings for his wife Beverly. To send flowers or a remembrance gift to the family of Robert Allen Bowen, please visit our Tribute Store. "Email Address" would like to share the life celebration of Robert Allen Bowen. Click on the "link" to go to share a favorite memory or leave a condolence message for the family.